India : The Two-Way Tuesday's outage affected nearly 200 million more people than live in North and Central America. It created chaos again in New Delhi and other major cities as trains and traffic stopped. 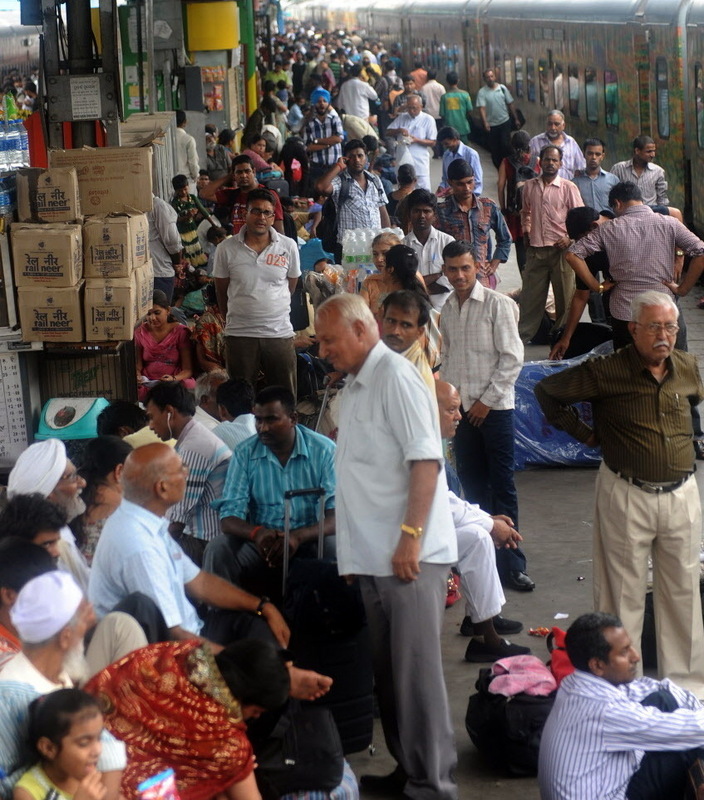 Passengers waited for trains Tuesday at a railway station in New Delhi. Another grid failure cut power, causing chaos. At day's end in India, after what's been called the "world's biggest blackout" ever, officials were reporting that electric service had been restored to most of the 670 million or so people who lost it on Tuesday. Just before midnight in India (2 p.m. ET), the Power Grid Corp. of India reported that the "power supply [had been] extended to all the affected states." This followed a massive outage that covered much of India's eastern and northern states and affected about half the country's population. Things have gotten even worse in India, where a power failure that affected about 370 million people on Monday was followed by an even larger grid collapse today that left about 670 million without access to electricity. That's nearly 200 million more people than the combined populations of Canada, the U.S., Mexico and the nations of Central America. The outage is affecting about half of India's population. From New Delhi, correspondent Elliot Hannon tells our Newscast Desk that "around 1 o'clock in the afternoon local time [today], the country's northern and eastern power grids failed. ... In New Delhi, schools and office workers poured out into the afternoon drizzle to try to beat the rush home. Stop lights were dark for the second straight day and the city's metro system again failed." According to the BBC, "the breakdown has hit a large swathe of the country including Delhi, Punjab, Haryana, Uttar Pradesh, Himachal Pradesh and Rajasthan states in the north, and West Bengal, Bihar, Orissa and Jharkhand in the east." It isn't clear when power will be restored to all those places. "Yes, I've heard that the Northern and Eastern grids have failed. We are looking into the matter. We are inquiring." Officials had earlier blamed the collapses on utilities in some states who tried to draw too much power from the overtaxed grid. "The power failure has raised serious concerns about India's outdated infrastructure and the government's inability to meet an insatiable appetite for energy, as the country vies to become a regional economic superpower." India's NewsX has a video report. "Any connection to the grid remains a luxury for many. One-third of India's households do not have enough electricity to power a light bulb, according to last year's census." In the midst of the crisis, Sushil Kumar Shinde has been shifted from head of the power ministry to be the home minister. As The Times of India writes, the appointment "is bizarre. It is like changing the captain of the Titanic as the ship is sinking." It adds that "the Congress [Party] leadership has shown callousness by removing him." According to the Hindustan Times, "corporate affairs minister M. Veerappa Moily was given the additional charge of power ministry." The Times of India now says that "67 crore" people — 670 million — have been affected by the outage. It's referring to this as the "world's biggest blackout." The Times of India is live blogging here. Its latest updates have Power Minister Shinde claiming power has been restored in some areas — "Northeast zone back to 100% normal: Shinde," is among the latest posts.